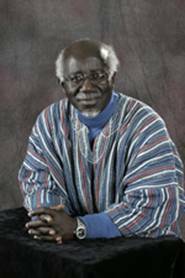 Kwame Bediako passed away this week. Langham Literature Director Pieter Kwant and I had the opportunity to visit him at the Global Church Tour in Grand Rapids in April, where he and his wife were spending some sabbatical time at Calvin College. Mark Hunt, Langham Partnership International’s board chair, had also met with him earlier in the year when he was among the speakers at the National Pastors Convention in San Diego. Kwame was one of the most remarkable senior African leaders I have ever met. He had a surpassing level of scholarship (two doctorates – one in English and one in French). He had a range of knowledge of the history of the church in Africa (and Europe) that could keep us spellbound for hours just listening to his stories. And he had a most profound understanding of the relationship between the gospel and African culture. He also had a huge passion to bring African Christians together to affirm their Christian identity in authentic ways that would overcome some of the worst legacies of the colonial era. And yet he wore all this learning with such a light touch. His twinkling eyes and sparkling humour and laughter were a constant tonic. It has been such a joy and privilege to know him for many years. The Akrofi Christaller Memorial Centre for Mission Studies, that he established at Akropong, Ghana, has a fine record of research and publication in African Christianity and contextual theology, and just recently got its charter from the government of Ghana for the awarding ofKwame Bediako degrees including doctorates. Kwame also had a deep love for John Stott, and the whole work and ethos of the Langham Partnership. He was not himself a Langham scholar, but he knew many of them, and was regarded as a mentor and father figure by many. Though a man under incredible pressures of work and leadership, Kwame stepped up immediately when I asked him, to arrange and chair the first Regional Council for West Africa (Anglophone) in Ghana 2006 , and to co-chair the first meeting of the Regional Council for Francophone Africa in Cameroon in 2007. When I last spoke to him, he was full of enthusiastic plans for the next meeting of both combined, to be held in Ghana in October 2008. So we shall miss him greatly. He is a sad loss to Ghana, to Africa, and indeed to the world church. Please pray for his wife (known to some as Gillian and to others as Mary), who has been totally involved in all the work that Kwame did, and is herself a writer and editor of immense experience. It is hard at a time like this to understand the ways of the Lord. But the legacy that Kwame Bediako leaves is simply enormous, and we pray that his ministry and contribution will now be multiplied even further through those whom he has mentored and inspired over the years.at Kwame Bediako leaves is simply enormous, and we pray that his ministry and contribution will now be multiplied even further through those whom he has mentored and inspired over the years.